GCSE maths revision cards aimed at grade A Star. These cards each have a question and fully explained answer. There are over 45 cards in this this pack. 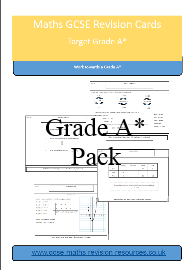 Check out our other GCSE revision packs for grade C and Grade B to A. You can also save by buying the combined packs.